When it comes to elevating your outdoor space, the sky is the limit, but unfortunately, so are budget requirements. And if you’re unhappy with having a garden that is uneven or sloping, then a retaining wall will instantly help you reimagine your outdoor space as you’ve always wanted it to be. A retaining wall enables you to make the best use of your space, creating functional areas out of space which was previously uneven and unusable. Not only will they help you make the most of your outdoor space, but they are great for defining areas, adding height, and adding a special sculptural quality to your garden. Best of all, though it can be a costly investment, it will without a doubt increase the resale value of your home while helping you enjoy your time spent outdoors for years to come. From concrete to wood retaining wall ideas, they can be made from all manner of different materials, giving you plenty of scope to maximize your garden appeal. To help you find the best retaining wall ideas for your home, we turned to Décor Aid renovation experts for their takes on getting the look right with confidence. Before We Get Started, What Is A Retaining Wall? A well-built and sturdy retaining wall does exactly what the name says, it retains dirt from moving about to create a structured surface. An outdoor retaining wall is usually used to retain earth or water, and this will have an effect on the style of wall and the materials you choose to use. You’ll find retaining wall ideas are often used to create a leveled space above them, on ground which is uneven or sloping. A retaining wall will, in essence, help you redefine your outdoor space and will keep everything secure, no matter the weather when built well. You might be left wondering where and why you might need to use a retaining wall. They are often used to terrace backyards – slopes can make back gardens into difficult spaces to use, and terracing your backyard gives you flat areas so you can make the best use of the space with the security of solid ground below you. Retaining wall ideas can also be used to help you create a patio or workspace to transition from the sidewalk to your home (if there is a gradient), or to create a driveway. Retaining walls also keep your property safe from various weather conditions that would ordinarily shift the ground and water around, eventually damaging your home foundation. Which Retaining Wall Materials Are The Best? 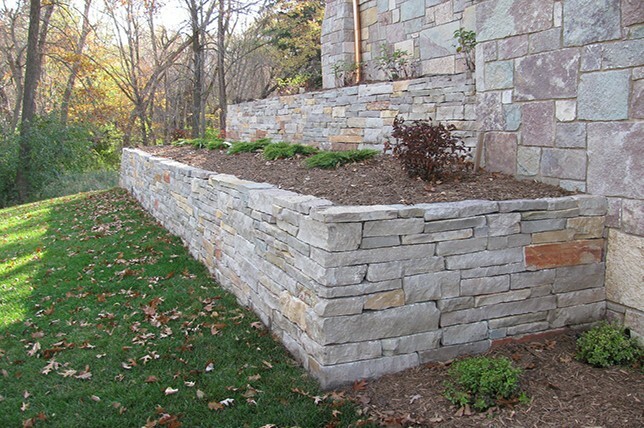 As you can imagine, there are scores of different types of materials you can use to create a retaining wall. Of course, each have their own pros and cons and at least one is sure suit your needs and your space right down to the ground. Timber is great for cheap retaining wall ideas and its easy to source. It’s inexpensive and is an easier option if you are considering a DIY retaining wall project. Crushed stone will be all you need for the walls footings, making for a simpler installation process. Pressure treated pine will last for years on end (up to 40 years), and trusty redwood can last up to 20 years, making them not the best option if you want retaining wall ideas which could last a lifetime. 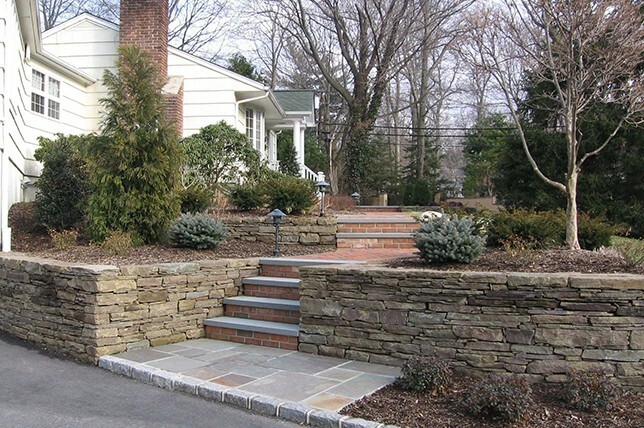 Retaining wall ideas made from concrete blocks, brick or stone can be long lasting when properly installed and well taken cared of and maintained. If you are really into the idea of a money-saving DIY retaining wall project, then this might be something you can do yourself, but you will more than likely need someone to come and install it for you as you depend on their effectiveness and expertise. Retaining wall ideas like this will also require concrete footings to keep them steady and secure, which can be challenging to get right on your own if you are a novice. Poured concrete retaining wall ideas are by far the most durable and will last you the longest. With them, you also have the option of having the concrete stamped, carved, and stained to make it look more unique than a standard smooth, grey concrete. You’ll need someone to turn concrete retaining wall ideas into a reality for you, as it’s challenging work. Poured concrete is the best option for pond retaining wall ideas, as it’s watertight and won’t spring any leaks. 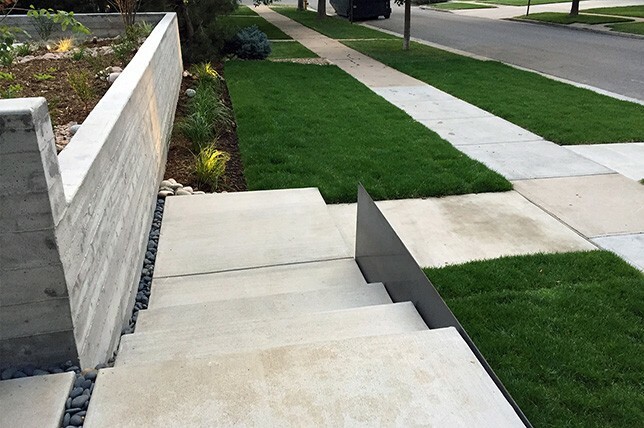 A poured concrete retaining wall will also pair well with a modern, minimal home thanks to its clean lines and ultra-smooth surfaces. Interlocking concrete blocks are some of the easiest materials to work with for any project. When it comes to the promise of a DIY task that you can master on your own, retaining wall ideas like these are great if you want and are able to do the work by yourself. They are easy to install, lightweight, and they fit together without the use of any mortar. They come in different color options so you can fit the style to your space, and they require a crushed stone footing. Another advantage of them not having to use mortar is that they can make for a temporary structure until you lock down retaining wall ideas that you truly like, and the fact that they can be moved around without having to be completely destroyed. From the idyllic and pastoral in feel to the sleek and refined, here are the best types of retaining wall styles to consider for your home. Dry stone walls look novel and traditional and perfect for an English or cottage-style garden. They are quirky and spirited, and they also don’t require any mortar. They make for a lovely addition to a garden full of flowers and greenery as they beautifully evoke the spirit of the countryside. And since a dry-stone retaining wall will lend your outdoor garden a timeless allure, its often our client’s most requested take on retaining wall ideas. Dry stone walls also provide you with a lot of crevices you can add plants in to maximize your green space in your garden. If you already have a retaining wall and you’re looking to do something to brighten it up, then introducing ivy and climbers into the equation is the way to go. Climbing plants are a wonderful way of adding greenery and hiding a retaining wall which has seen better days, or you consider to be an eyesore, without having to spend a small fortune. Choose a climber which blooms over a long period of time and stays green. Keep the health of your wall in mind and attach a trellis to it, allowing your climbers to cling to that instead of having their roots seep through your retaining wall. That said, climbers make for the ultimate addition to inexpensive retaining wall ideas that boast a countryside feel. Railway sleepers are perfect if you are looking for a low retaining wall or wood retaining wall ideas. Railway sleepers are heavy duty and will last for a good, long while. And they look stunning in any situation. They’re perfect for a small outside area or backyard and are relatively inexpensive compared to more labor-intensive options. And thanks to their pretty straightforward construction, railway sleepers make great inexpensive retaining wall ideas. To get the look right, simply dig a deep enough trench, lower the sleepers(or beams) in side by side vertically, and then fill the spaces in with a dry concrete blend, and the push the railway sleepers in until the new wall feels secured. If you have a lot of ground to cover in a small area or you like the look of lower retaining walls better, then stacked retaining walls are a smart alternative to view blocking styles. Not only do they add needed depth to your garden, but they also provide you with a host of endless garden design options. With stacked retaining walls, each level could have a different planting scheme, or a different influence or design direction altogether. As retaining wall ideas go, this one always evokes an elegant and clean look and feel. Wide fence panels make for a majority of retaining wall ideas and are incredibly popular as well. They look terrific set against the lusciousness of a garden, and they can be customized to match the design of any garden. They are by far the most flexible of all retaining wall options as you can stain and paint your fence panels in any paint color that works for your home. And you can make it look all the more interesting and unique to you by painting a graphic contrasting design or a mural that is not too heavily themed. A curved retaining wall is a great way of adding some style to your garden. Offering something a little different than your usual retaining walls, a curve will add dimension and depth to your outdoor space while making it look all the more interesting. Whether you are interested in concrete retaining wall ideas, or wood retaining wall ideas, throw in a curve and you’ll be sure you won’t regret it. If you have a bit of a slope in your garden but it isn’t too steep, then a simple retaining wall made from rocks might just be the best solution for your backyard. This idea can become part of your garden seamlessly when surrounded by foliage and flowers while blending in with the rest of the space. Not only is it simple and effective, but it’s also inexpensive, so it’s great if you are interested in cheap retaining wall ideas. It will also add some extra visual interest and will help to better differentiate the zones in your outdoor area. Have some fun with your retaining wall and make it into a piece of art – with different sizes, shapes, and colors of stone juxtaposed with one another. With a little ingenuity and careful planning, you can easily create a retaining wall that will look like no one else’s. Our renovation experts approve of this take for front yard retaining wall ideas and driveway retaining wall ideas as well, as it’ll completely elevate your home’s curbside appeal without having to try too hard or be drastic. A retaining wall with steps is the ideal way to create a pathway from the sidewalk or from the driveway to your front door. Setting steps within the retaining wall is a space defining way of doing this, as it keeps the flow and allows your style to run throughout.